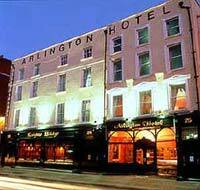 Perfectly located in Bachelors Walk The Arlington Hotel overlooks the River Liffey. This hotel has amazing style and character. Situated in the perfect location for guests to explore and enjoy this cosmopolitan city. The hotel is located in the heart of a buzzing night life and wonderful shopping facilities. The hotel offers exceptional amenities in this beautiful renovated Georgian building. The high standard of service and warm welcome in The Arlington Hotel is reflected in the many repeat visitors. The 115 spacious en suite bedrooms and executive mini suites are decorated to the highest international standards. The facilities include in house movies, direct dial telephones, trouser presses, hairdryers and more. The executive mini suites in the hotel's Georgian wing offer many additional facilities including ISDN and fax/modem lines to facilitate the business traveler. The staff will do everything possible to ensure every comfort for the guest. Excellent wining and dining facilities are available in the Knightsbridge Bars, Knights Bistro and the Boardwalk Nite Club. Live entertainment of Irish music and dancing is available six nights a week. The Knightsbridge Bars offer a wide-ranging bar menu and top class dining facilities are available in the Knightsbridge Bistro which offers a range of excellent cuisine. Ideally located and overlooking the River Liffey, The Arlington Hotel is adjacent to O'Connell Street, and a short walk away from the shopping areas of Henry Street, Talbot Street and Grafton Street. Here you will find the shopping facilities you would expect from a modern city. Temple Bar with its quaint shops and cobble stoned streets is just a moment away.